Every gardener needs a decent garden hose to water the garden with. A decent garden hose should last you several years, and whilst it’s often tempting to go for the cheapest option, unless you want to have to replace it every year due to leaks, cracks, and general degrading, then you might want to consider spending a bit more for something robust. Over the long term, it will save you more money. Given that garden hoses are often kept out in the elements, they should be made from weather resistant material. In particular they should have good UV protection to help prevent degradation from sunlight. 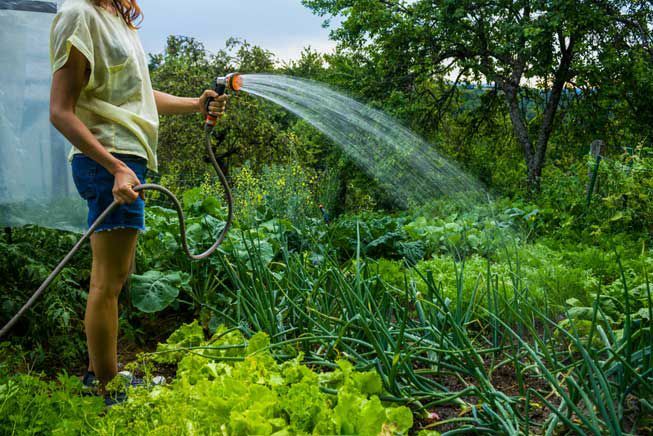 Given that, if you want to extend the life of any garden hose, consider purchasing a garden hose reel (one with wheels helps to move it more easily) and keeping the hose inside your garden shed or garage after use. Hoses are usually made from vinyl or rubber, or a vinyl / rubber composite, and unless they’re a very cheap hose, they are usually reinforced with an inbuilt mesh lining between the individual layers to give the hose extra strength. Most vinyl or rubber hoses aren’t suitable for drinking water, so if you’re concerned about that then a hose made from polyurethane is a better alternative as they are specifically designed to be safe to drink water from. Something else you might like to consider is the length of the garden hose. Longer is not always better, as they can be heavier and more cumbersome to move around the garden. So purchasing a hose that is suitable for the length of the job you intend to use it for might be a good idea, especially as it’s easy enough to join several shorter hoses together in the future if required. 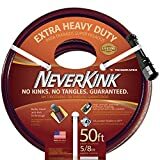 Keep in mind that most garden hoses will sometimes “kink” (pinching off the water flow) – even those advertised as “kink free”. This is due to the fact the all hoses will gain an inherent memory when stored and try to revert back to that position when unraveled. This can be reduced as much as possible by purchasing a hose with good internal mesh reinforcing. Another great tip to help reduce kinking in hoses is to fold and store them in a “figure 8” pattern after use, rather than coiled into a tight circle. The Teknor Apex NeverKink garden hose comes in 50, 75 and 100 foot lengths. It has a 5/8 inch diameter that produces around 5.5 gallons per minute of water flow. The hose also contains MicroShield antimicrobial protection which guards the hose against mold and mildew. The hose features a patented technology called NTS (Non-Torsion System) which is the translucent strip that runs its length and is designed to make the hose “Kink Free”. It also has mesh reinforcement throughout the length of the hose to further strengthen it. The couplings at the end are made with high strength aluminium so they won’t corrode or rust and they’re also lead free. These can withstand 1,200 pounds of crushing force. A nice feature are the rigid sleeves at the coupling ends to help prevent kinking near the faucet. This hose is made in the USA and comes with a lifetime guarantee. The Water Right Slim Garden Hose comes in 25, 50, 75 and 100 foot lengths. The model featured has a 7/16 inch diameter which produces around 4-5 gallons per minute water flow, however it also comes in larger diameters if you would prefer more water flow. This range of hoses are made from light weight NSF grade polyurethane which is 100% lead-free, UV stabilized and therefore is suitable for drinking water. The Hospaip 50ft Garden Hose is an expandable water hose made from a double latex core surrounded by an extra strength polyester fabric cover. Being an expandable hose it unravels itself when you turn on the water (as the pressure builds up inside it), and it will then retract to roughly it’s original size when finished (small enough to keep in a bucket or the storage bag it comes with). 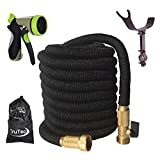 The TruTec expandable garden hose comes in 50, 75 and 100 feet lengths and claims to be the strongest expandable hose on the market due to its triple layer latex core. The core is surrounded in a woven seamless outer covering meaning there are no seams to break or split. 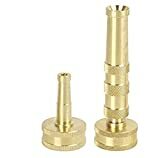 It has solid brass fittings, one of which includes a shut off value which is very handy to shut off the hose (to potentially change nozzles) without having to go all the way back to the faucet to do so. It also comes with a hose holder / rack which you can screw to a wall to keep the hose off the ground and somewhere handy.